Wow, I had never thought of it like that! Such a nice, refreshing view... Rather than wanting to stick to shop-bought why not allow natural and personal selection to create the healthiest, best suited plants for your own garden?? Yay! 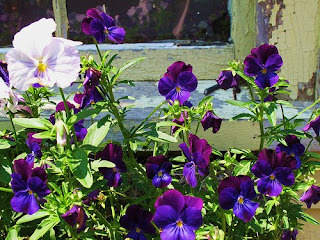 for Violas, small but mighty. I love the gorgeous colors and how they keep coming back, in spite of our lack of attention. Isn't it lovely when a plant decides that your place is worth hanging about in and comes back through its seeds. Makes you feel so good, especially if they seed themselves in an unexpected spot. Hope your next viola experiment is just as successful.